All the old adages about persistence paying off may be justified if R. Stevie Moore penetrates college radio and specialty record stores in 1984 -- makes it big, by his lights. For the past 10 years, Moore has been steadily, almost obsessively, producing idiosyncratic pop music as if it were a cottage industry -- composing, playing and recording at home at the rate of about one song per day (more music than most fans could probably absorb). A handful of his independent releases in the late '70s (on the now-defunct H.P. 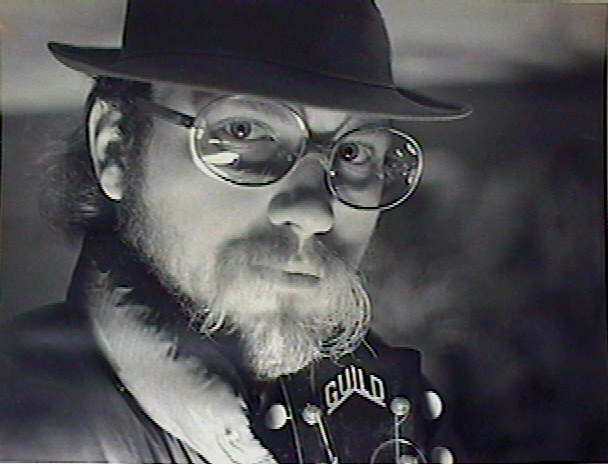 Music label) earned the praises of such notorious curmudgeons as the Residents and established Moore as the patron saint of do-it-yourself recording, at least in America. Since then, occasional obscure singles and appearances on random anthologies have maintained Moore's career in the comparative obscurity of cult heroism. Which might suit him fine, but he's intransigent enough not to pander to an audience, misanthropic enough not to appreciate one, and self-contained enough never to need one. It's not that his music is convoluted or cold, just that he cherishes his homespun self-produced recordings, inside jokes and quirks, even his mistakes. It might be entertaining, but it's autobiography first. This year, however, two new records showcase Moore for the masses. The double album Everything You Always Wanted To Know About R. Stevie Moore But Were Afraid To Ask (New Rose import) almost lives up to its grandiose title: if it tries to cast Moore as a coy anchorite Zappa clone, it also demonstrates the breadth of pop iconography he commands and documents his longstanding infatuation with the tape recorder. A forthcoming Moore LP, What's The Point?!! (Cuneiform) concentrates more on the dry humor in his songwriting and the exuberance of his rock and roll, especially his effervescent polytonal guitar solos. Both albums are curious, a bit primitive, and not a little absurd, but both offer strong evidence of a durable amateur, in the original (and best) sense: someone who loves his work too much to make a career out of it, the apotheosis of a ravenous listener and devout fan. Music was part of Moore's upbringing, so he got to see first hand what it was like as a job. His father was a crack Nashville session player on string bass. One uncle was a professional record-company executive (who later administered H.P. Music in his spare time); another was Scotty Moore (sic), of Elvis Presley fame. The young R. Stevie never cared much for Nashville's indiginous country music (he views it now as occasion for parody: his "Topic of Same" derides the genre as much for its hick mannerisms as for its homiletics) but fell prey to the rock of the '60s, particularly the British Invasion. Even now, Moore invites comparison with performers in the English-eccentric tradition: Ray Davies, Marc Bolan, 10cc's several songwriters. But with his laconic baritone and his genial air of cosmic indolence, he most recalls Kevin Ayers (not that anyone who writes and records an hour of new music every month should be accused of laziness). While building up his chops with the usual quota of local garage bands, Moore also began working out with a pair of tape decks in the basement, stubbornly practising the techniques of microphone placement, bouncing tracks, echo delay, altering tape speed. He was always fascinated with making things sound funny: at the age of seven he recorded a commercial jingle off the radio (sic) and messed up the tape speed, apparently by dragging his thumb on the reels. (This experiment now appears on Everything under the title "Pasketti.") By 1974, when he began amassing material for his first album Phonography, he had acquired a good understanding of how best to use the primitive hardware at his disposal. His wispy voice could be bolstered by tape echo and judicious overdubs; his heavily fuzzed or phased guitars and cheap synthesizers agglomerated into a low-tech analogue of Phil Spector's wall-of-sound; his cheesy drum machine, condemned by the bounce-back process to a horrible signal-to-noise ratio, became an abstraction of rhythm, and thus the more effective as an unadorned timekeeper for his quirks. Some of his projects aren't songs at all but little playlets or sound collages that he imbues with tricks of audio-verite, much as a TV producer does. In "Welcome To London," his homage to English taste, he tweezes in sound effects of street traffic and Big Ben behind some limey complaining about "that country hillbilly crap." Sometimes he even inserts extra sounds into more conventional songs: a tape of kids at play makes peculiar sense in "Teen Routines," though the overspeed declaiming of all the Moores in the phone book during his jet-propelled rendition of "Chantilly Lace" is too much of an inside joke. His weirder timbres and noises tend to expand the perceived space in his tapes, sometimes beyond what a low-budget studio is supposed to be capable of. Just as Jimi Hendrix played the studio as an instrument, Moore's forte is improvising on a pair of Teacs in the basement. His affinity for machines is proportional to his disinclination toward people. Moore's favorite songwriting subject is the pettinesses of humanity. His love songs often feature brutal twists: in one ditty, he croons his romantic yearnings in an innocent falsetto, over chiming guitars and close harmonies, but the chorus (and title) of the song is "I Wanna Hit You"; in "Debbie" he sings, in a light bossa nova, "I can't respect you, I'm sorry, but I just want your body," the last clause almost swallowed at double time. His more credible social commentaries wallow in fake teen angst and sincere misanthropy that verge on the morbid -- "The Holocaust Parade," with its dippy Kinks-like melody, or "The Meeting That Couldn't Be," a bleary and pathetic monodrama. "I Hate People" could be his manifesto; it rocks out as forthrightly as any of his numbers do. Moore is well aware of the chief advantage of working on his own: the luxury to pursue any idea he concocts, no matter how bizarre or cornball. Without interference from colleagues, he manages stunts and juxtapositions conventional groups couldn't imagine, let alone attempt. In "Play" he twists headbanger guitar riffs through a series of wry jazz modulations comparable to Steely Dan's. The skeletal electrofunk synth-bass line of "Show Biz Is Dead" reacts with a vocal in essentially free meter to create alien polyrhythms unlikely to be reproduced on stage. He can free-associate senselessly without embarrassment, as in the jangly "Compatibility Leaves" (which suggests R.E.M. but was recorded years earlier). He can rap in harmony with himself, as in the lunatic weather-report parody "Forecast." He composes theme music to movies only he can imagine, like the sumptuous instrumental "World's Fair." In fact, you almost hope Moore never makes it big, lest he forget the liberation of solitude. Not everything he does is top drawer. Cuneiform plowed through more than 300 songs and vignettes to cull the 14 tracks on What's The Point?!!. (Of course, if that quantity is a year's work for Moore, then he can make one strong album a year, the way the pop stars do). But even when he's terminally silly or grotesque, as in too many garish tracks on Everything, he avoids the cliches of commercial radio. He always thinks like a recluse, which is the crux of his charm. (But also, he listens to a phenomenal number of performers -- he covered Slade a decade before Quiet Riot did -- and he occasionally uses other musicians, especially drummers.) The difference between his two new records is that Everything allows his eccentricities to obscure his musicanship. That album's "Jump Out In Front Of A Car" becomes an instrumental, "Where You Reside," on What's The Point?!!. And there, unencumbered by the song's cranky lyric, you can hear his clever synth fills and aptly abrasive guitar: the sound of one man clapping.